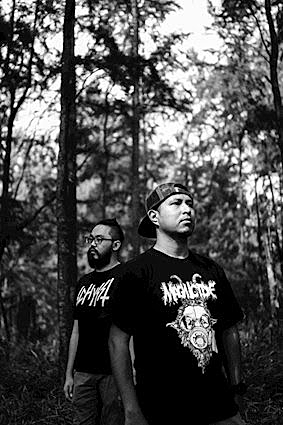 While Southeast Asia’s metal scene is often associated with death metal, dynamic duo Onset proves that not only does slow have its space, but so does a more genreless conception of metal more broadly. Formed in late 2016 by drummer/bassist Shamtos (Septikaemia) and guitarist Calvin Chiang (Punebre, Raspatul), Onset released the two-track instrumental EP Unstructured Dissemination earlier this year featuring contributions from Mirai Kawashima (Sigh) and Microchip Terror. A major milestone in the era of Bandcamp approaches for the pair as they prepare to release the first-ever physical copies of a vision that’s only ever lived in the walls of the digital sphere. Unstructured Dissemination is a floaty trip through space as much as it is the thrust of heavy gravitational pull. While the steady pace of the album makes it easy to call it doom and call it a day, the growth found within both stealthy tracks suggests that there’s more to the story. In order to get a better understanding of its journey to existence, we spoke with Chiang about stylistic surveys, scenes of Singapore, and shooting for the stars. Onset has gotten together within the past couple of years, but I understand that you guys have been playing music for quite some time. What were you doing prior to Onset and what ultimately made you decide to embark on a new project together? Indeed, both the drummer Shamtos and myself were previously playing in other bands prior to the formation of Onset. I was in a death/thrash band called Raspatul for a number of years and Shamtos was in a Grindcore band called Desolation. Both of us kinda completely stopped playing music entirely up until the point where Onset was formed about two years ago although we hadn’t stopped listening to music, so to speak. I’m now still co-running Pulverised Records and it’s my full-time job. I think it was for the fact that we wanted to reach out to playing something that isn’t within our comfort zone, kind of like a challenge to us in some ways. Personally I have always been into the slower aspects of extreme music even when I was trying to discover so many bands during my teenage years. That weary and dreadful sense of feeling is almost always evident when it comes to the basic nature of the Doom genre. To say that Onset is diverse stylistically is an understatement. What inspired you to play this atmospheric survey of metal? Thank you so much. This is such a great compliment to us. To be honest with you, to have diversity in the music that we write is one of the very reasons why Onset was formed. We wanted to make sure that it had all the essence we loved about the doom genre and even reaching beyond post-rock and ambient territories. I think the inspiration sometimes comes from within ourselves and a lot of times the riffs and ideas were simply spontaneous rehearsal jams in the studio. We’ll keep the riffs if they are cool and usually will further expand on them later on. It has got a lot of to do with listening to what we’re playing and if it feels right to our ears. Both Shamtos and myself are not musically trained at all, so 99 percent of the time we are just playing what sounds good to us. Is slower tempo metal popular within your circles in Singapore or are you guys off blazing your own trails? Not at all, in fact there are probably less than a handful of doom/stoner bands over here really. Generally the interest here for such music isn’t huge at all and most of them still treat doom as a form of very selective listening. We are probably doing something somewhat unique to our own; even more so since we’re now known as an instrumental doom band. What are you most looking forward to about finally being able to hold your debut EP in your hands? Actually we have just received the EP yesterday and it’s a pretty surreal feeling to finally have the physical product in our hands now. It was slightly more than a year ago that we stepped into the studio to record Unstructured Dissemination. We were extremely curious to hear how we sound with all the additional layers of instruments as we have always rehearsed as a two-piece in the studio. As for now, it’s up to the listeners to be the judge of what they think of the music but so far the response coming in have mostly been pretty positive. What are your hopes for Onset as we stagger into yet another slow and tedious year around the sun? We have already recorded a brand new song a couple of months ago but for now only the rhythm guitars and drums are done and we still have a couple of recording sessions to go. The new song has a running time of 30 minutes and it’s pretty daunting just to think about it. We recorded the new song in the same fashion as how Unstructured Dissemination was done; basically with Shamtos and myself in the studio recording the song live from start to finish. I know this sounds cliche but the new song is much heavier than both the songs on Unstructured Dissemination and I think we can’t deny the fact that the both of us will always have a soft spot for the heavier side of music. It will definitely be finished by 2019 and we like to think that we have already started to evolve on this brand new song. The official CD edition of Unstructured Dissemination drops November 28 via Weird Truth. Follow Onset on Facebook.